I'm having a creative day for ME today! Just catching up on some things, playing along with some challenges - what better thing to do on a cold day! I couldn't resist playing along with the beautiful inspiration photo at Pals Paper Arts. With the cold weather and snow we've been having, and the inspiration from the photos, I thought it would be perfect to incorporate some of the stamps and dies from Heartfelt Creations. 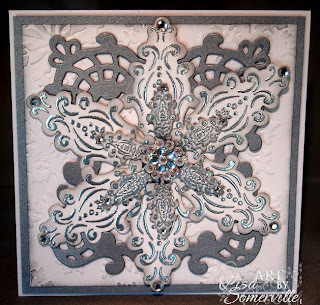 The snowflakes are embossed in Silver then cut using the Holly-Ornament Die. I created both large and small snowflake medallions and popped up every other one to add dimension, then added the smaller ones on the large, and added a bling center. I layered the snowflake over the Decorative Window Scene Die that I cut in Brushed Silver. The White panel is embossed with the Texture Fades Snowflake folder. Wow! Beautiful snowflake! Thanks for playing at Pals Paper Arts! Oooh, such a beautiful snowflake and card! Great take on the photo! Thanks so much for playing at PPA with us this week! Lisa, this is BEAUTIFUL and it surely takes bits and pieces of the photos of inspiration! It is wonderful! I love how you layered them! So intricate and beautifully detailed! Stunning! Gorgeous card. You know i love all the bling! Snowflake is beautiful, so elegant looking and such detail to it.